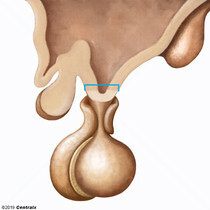 A small, unpaired gland situated in the SELLA TURCICA. 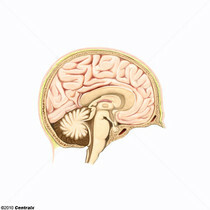 It is connected to the HYPOTHALAMUS by a short stalk. 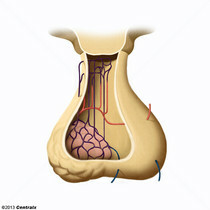 The anterior glandular lobe of the pituitary gland, also known as the adenohypophysis. 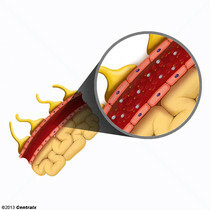 It secretes the ADENOHYPOPHYSEAL HORMONES that regulate vital functions such as GROWTH; METABOLISM; and REPRODUCTION. 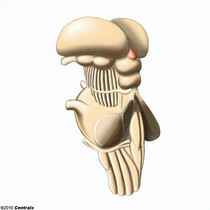 Anterior pituitary cells that produce PROLACTIN. The intermediate lobe of the pituitary gland. It shows considerable size variation among the species, small in humans, and large in amphibians and lower vertebrates. This lobe produces mainly MELANOCYTE-STIMULATING HORMONES and other peptides from post-translational processing of pro-opiomelanocortin (POMC). A system of neurons that has the specialized function to produce and secrete hormones, and that constitutes, in whole or in part, an endocrine organ or system. 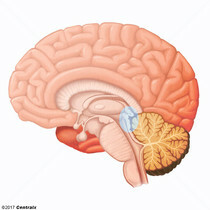 Raised area at the infundibular region of the HYPOTHALAMUS at the floor of the BRAIN, ventral to the THIRD VENTRICLE and adjacent to the ARCUATE NUCLEUS. It contains the terminals of hypothalamic neurons and the capillary network of hypophyseal portal system, thus serving as a neuroendocrine link between the brain and the PITUITARY GLAND. 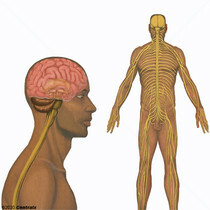 The main information-processing organs of the nervous system, consisting of the brain, spinal cord, and meninges. The part of CENTRAL NERVOUS SYSTEM that is contained within the skull (CRANIUM). Arising from the NEURAL TUBE, the embryonic brain is comprised of three major parts including PROSENCEPHALON (the forebrain); MESENCEPHALON (the midbrain); and RHOMBENCEPHALON (the hindbrain). The developed brain consists of CEREBRUM; CEREBELLUM; and other structures in the BRAIN STEM. 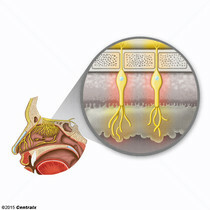 Region of hypothalamus between the anterior commissure and optic chiasm. 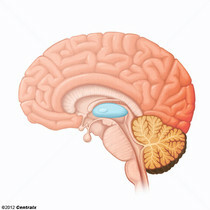 A nucleus located in the middle hypothalamus in the most ventral part of the third ventricle near the entrance of the infundibular recess. 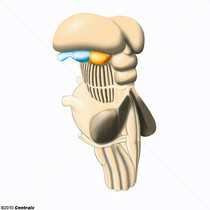 Its small cells are in close contact with the ependyma. Paired bodies containing mostly gray substance and forming part of the lateral wall of the third ventricle of the brain. 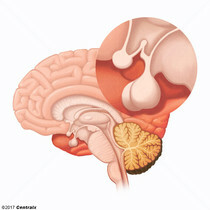 The thalamus represents the major portion of the diencephalon and is commonly divided into cellular aggregates known as nuclear groups. 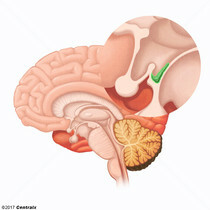 Part of the diencephalon inferior to the caudal end of the dorsal thalamus. 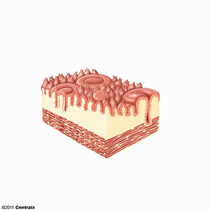 Includes the lateral geniculate body which relays visual impulses from the optic tract to the calcarine cortex, and the medial geniculate body which relays auditory impulses from the lateral lemniscus to the auditory cortex.